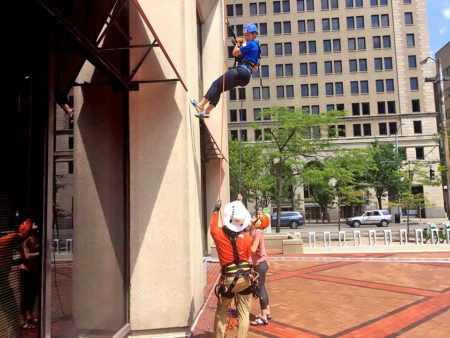 Our First Rappelling to End Homelessness was a success, thanks to you! down the nine story Comeau Building for Rappelling to End Homelessness. posted flyers, and came to watch our first ever Rappelling event, we are so grateful! all to break the cycle of homelessness here in Palm Beach County. Your Journey DOWN is Their Journey UP! Enjoy the pictures from this years event here. RAPPELLING to End Homelessness dares to bring awareness to the nearly 3,000 people who are experiencing homelessness here in Palm Beach County. Staffed by the experienced and professional team at Over the Edge (overtheedgeglobal.com), this event will be sure to bring a new daring crowd, and bring The Lord’s Place name and mission to new heights! On February 2, join us at the Comeau Building in downtown West Palm Beach. Two rappelling stations will be set up throughout the day, during which there will be regular downtown foot-traffic and the well-attended Greenmarket. 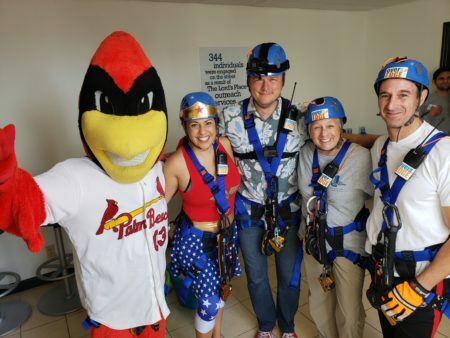 Join us as a sponsor, dare to rappel yourself, or challenge your ”Fearless Leader”, where a group can fundraise to challenge their leader to rappel themselves! Whatever your interest, there is an opportunity for everyone to be involved! Who Can Rappel to End Homelessness? It is free to attend the event and watch. However, if you would like to rappel, there is a $25 registration fee and an overall fundraising minimum of $500. We do encourage you to raise more than the minimum, and will have great incentives to help you along the way. We ask you to raise at least $500, as this is what it is going to take to help each of our clients end their cycle of homelessness in Palm Beach County! Participants must weigh between 100 and 300 pounds. You must be at least 18 years old to rappel. Does your boss impress you with his or her ability to lead your agency? Do you witness bold ideas, courageous changes or overall bravery? Honor your leader by gathering your colleagues to raise $1,500 and awareness to break the cycle of homelessness here in Palm Beach County. This will not only impress your fearless leader, but it will also be a challenge to journey down the Comeau Building. Some leaders may choose a twist however, match the donation, and send one of you RAPPELLING in their place! Companies and organizations that raise more than $2,500 are eligible for the benefits of corporate sponsorship. Email info@TheLordsPlace.org or call 561-578-4928 to learn more!